The first package is an M2 Garage kit of a ‘68 Shelby GT500KR. I found this on eBay and am not a huge Mustang guy, but I love the accessories. It comes with 2 motors (a Cobra 427 and a Windsor V8), 2 sets of wheels and tires (Cragars and steelies) and a lift! I want to do a garage diorama so the lift will be great not only to use, but also as a muse to build more. I wasn’t looking for one, but when I came across this set on eBay for $8 shipped, how could I say no. 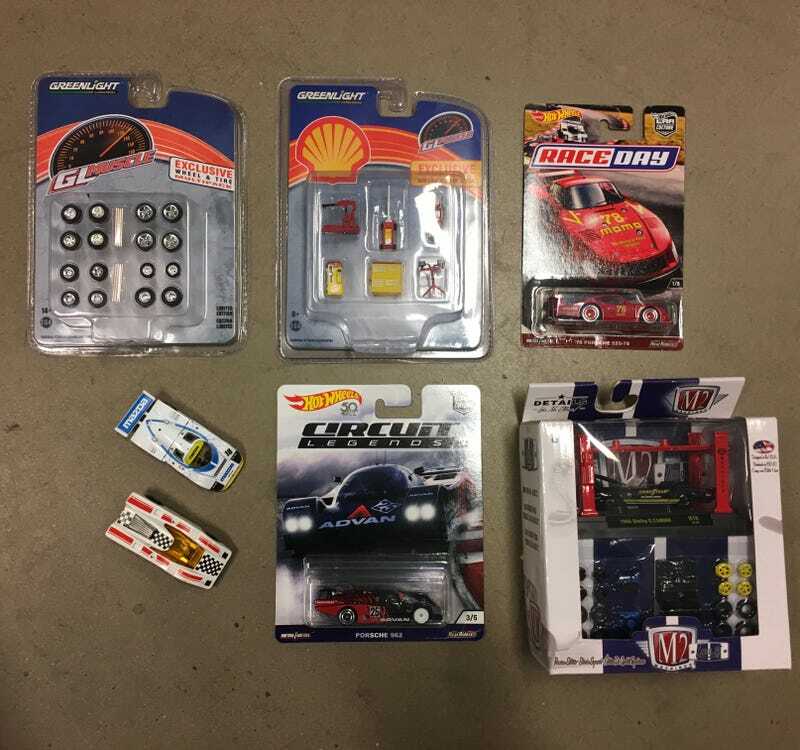 The next package was another eBay find - a Greenlight Shell garage pack and a Greenlight muscle wheels pack. I was looking for garage equipment for my planned diorama, and I found a listing for these 2 packages for roughly the price of the Greenlight garage stuff alone. Another instant purchase! The final package is my favorite. This came from fellow LaLDer Doug, who informed me he had a Mazda 787 after I commented on another post about how I can’t find one to save my life. He asked me what else I was looking for and tracked down a Porsche 962 and 935/78, 2 cars I’ve been longing for. He also gave me a cool, funky Matchbox Hairy Hustler, which will live on my desk at work. Thanks so much Doug! LaLD really is the best place on the internet. Note: Doug sent me the Mazda packaged, but I was so excited I opened it up before taking pictures. Also, apologies for my low-quality at-work photos.